where Q is the incoming solar radiation intensity, while af is the aldebo. By combining [6.1] and [6.2] an equation can be obtained relating the temperature to the intensity of incoming radiation, extent of cloud cover and aldebo. A simple calculation shows that a change of 1 % in average albedo produces an average temperature variation of 2.3 C.
Let us consider in more detail the relation between albedo and atmospheric aerosol particles in the case of one aerosol layer in the lower atmosphere (see Fig. 58; Schneider and Kellogg, 1973). In this figure QIS is the intensity of incoming radiation, taken as unity. 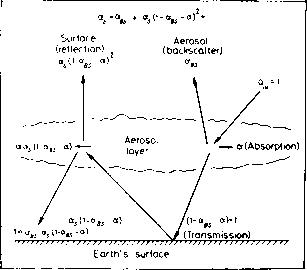 Furthermore, a is the albedo of the aerosol layer while a gives the absorption by particles. Owing to scattering and absorption by the layer, the radiation intensity at the surface will be (1 — ags - a). This quantity is termed the transmission. If the albedo of the surface is equal to atthen the radiation intensity reflected by the surface will be as(l — ags_ —a). A certain part of this radiation is scattered back in the direction of the incoming radiation, while an other part is absorbed by the particles. If we subtract these fractions from the intensity reflected by the surface the so-called surface reflection is obtained. The total albedo, a is obviously given by the sum of aerosol backscatter and surface reflection.-1 Let us suppose that aBS=a = 0.05 and as = 0.1, which seem to be acceptable values. Under these conditions a. (0.131) is greater than the albedo without the aerosol layer (a =a =0.1). An increase of 3.1 ",, in albedo implies a significant temperature decrease in the surface air according to the above hypothesis of Budyko (1969). Calculations made by this global-average model further indicate that the presence of an aerosol layer leads to a decrease in the value of total albedo if the surface albedo is greater than about 0.5. In other words this means that the aerosol layer causes an increase in the surface air temperature over a surface covered by ice. Furthermore, since the albedo of dense clouds is also high, the effect of an aerosol depends on its position relative to the clouds. If the particles are below the cloud cover they produce cooling, while above the clouds their presence tends to raise the surface air temperature. It is thus concluded that the effect of an increase in the concentration of aerosol particles is a function of the albedo of the Earth's surface below. 3 The ellipsis in the formula at the top of the figure indicates that the fraction of the radiation intensity scattered downward by the aerosol layer is again reflected by the surface and this phenomenon continues ad infinitum. However, the significance of these supplementary terms is small. caused by American and European sulfur emission corresponds to a temperature drop of 0.03-0.06 C.
In Section 6.4 of this book evidence is presented showing that the temperature of the atmosphere dropped after the middle of the forties. At first sight it would seem reasonable to attribute this temperature drop to the increase of the concentration of anthropogenic aerosol particles. In Chapter 4 we saw that electrical measurements indicate an increase of the aerosol over the Northern Hemisphere which can be probably explained by the increase of the emission of gaseous sulfur compounds. However, in the Southern Hemisphere no such increase was found, but the temperature also decreased during this time period. Furthermore, the calculation of Bolin and Charlson (1976) indicate smaller changes than those observed. Finally, the temperature drop has been the greatest over the regions where we could expect a temperature increase due to the high albedo of the surface (see above). We have to conclude that the temperature decrease measured after 1940 cannot be attributed directly to anthropogenic particle pollution. However, the problem is more complicated than the foregoing discussion shows. By acting as condensation nuclei, aerosol particles can also modify the average cloud distribution, which determines the albedo in a very significant way. We remind the reader of Subsection 5.3.1 in which it is argued that an increase of condensation nuclei produces clouds with many small drops. These clouds are rather stable systems (Fletcher( 1962) since the probability of precipitation formation is rather low in clouds with small drops. Thus, an increase in the concentration of aerosol particles tends to increase the lifetime of clouds. The formation rate of natural and anthropogenic condensation nuclei active at a supersaturation of 0.5 % was determined by Squires (1966). His results with respect to the U.S.A. and to the Northern Hemisphere are tabulated in Table 30. One can see from these estimates that the anthropogenic fraction provides 14 % of the condensation nuclei of natural origin over the U.S.A. The corresponding percentage value for the whole of the Northern Hemisphere is estimated to be 5 %. This means that on a global scale the formation of clouds is not yet significantly modified by the activity of mankind. However, over more industrialized areas like Western Europe the number of natural and anthropogenic nuclei is estimated to be comparable (Pruppacher, 1973). According to Twomey (1977) an increase of cloud droplet concentration involves an increase of the albedo if other factors (liquid water content, thickness of cloud) remain constant. Thus, for a cloud thickness of 0.1 km (liquid water content 0.3 g m~3)the albedo is raised from 0.25 to 0.43 when the drop concentration is increased by a factor of eight. For a cloud with a thickness of 1 km the corresponding albedo increase is from 0.82 to 0.90. However, an increase in the optical thickness of a cloud also leads to a higher absorption of the infrared radiation emitted by the Earth's surface. The effect of an increase in the extent of cloud cover on the atmospheric heat balance was numerically studied by Schneider (1972). He took into account the variation of the planetary albedo as well as the decrease of the infrared radiation loss. Schneider found that a more extensive cloud cover produces a temperature drop at low and midlatitudes if the height, thickness and albedo of the clouds remain unchanged. In contrast, over polar regions, where the intensity of incoming solar radiation is low and the surface albedo is great, an increase in the extent of cloud cover leads to a temperature rise in the surface air. A small but important class of atmospheric aerosol particles are the ice nuclei. These nuclei promote the freezing of water drops in clouds (see Fletcher, 1962). In this way they play a definite role in the formation of precipitation in mixed clouds containing both water drops and ice crystals. This kind of precipitation formation is due to the fact that the saturation vapour pressure over ice is smaller than over liquid water. In this way ice crystals grow by condensation while drops tend to evaporate. Thus, if human activity emits ice nuclei to the atmosphere the precipitation distribution can be modified. Results of measurements show that in the vicinity of steel works and aluminum foundries the concentration of ice nuclei active at a temperature of — 20 °C is unusually high. It is believed that this is caused by the presence of some metal oxides in the air (Pruppacher, 1973). More recent studies on ice nuclei also showed that lead compounds (e.g. Pbl2) in exhaust gases of vehicles also have ice nucleating ability. It is believed, however, that anthropogenic ice nuclei cannot play an important role, except in local scale processes (see Pruppacher, 1973). Finally, it should be mentioned that cirrus clouds formed in the upper troposphere can also control the radiation balance of the atmosphere. On occasion these clouds are certainly caused by the growth of condensation trails from highflying aircraft. This problem is important from the point of view of anthropogenic modification of the atmospheric composition since a significant quantity of water vapour (and ice nuclei?) is emitted in aircraft exhaust. Hence it is not surprising that in recent years the quantity of cirrus clouds has increased. It is estimated by experts (see SMIC, 1<)71) that in day-time the albedo increase caused by these clouds generally exceeds the effects of absorption of infrared radiation by ice crystals. This means that cirrus clouds cool the troposphere in day-time. At night, however, cirrus clouds produce the inverse effect on the tropospheric temperature in the majority of cases. In the last subsection the relation between short-wave radiative transfer and tropospheric composition changes has been presented. The aim of this subsection is to discuss the interaction between infrared radiation emitted by the Earth's surface and variations in the chemical composition of the troposphere. Since the influence of aerosol particles on infrared radiative transfer is not clear and is sometimes neglected,4 this paragraph is devoted to the effects of the carbon dioxide increase, which seems to be a very important environmental factor. 4 The effect of other anthropogenic gases (H20, halocarbons, etc.) on infrared radiative transfer can also be neglected compared to that of C02 (Kellogg, 1977). In this book we have restricted our discussion to the atmospheric pathways of constituents. However, before discussing the climatic effects of the carbon dioxide increase, it seems useful to study briefly the global cycle of carbon in nature, including all terrestrial reservoirs. 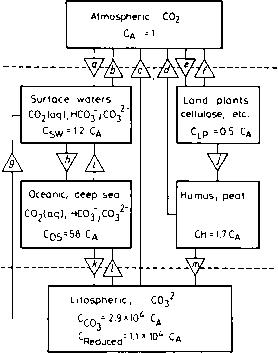 Figure 59 gives the cycle of the carbon in nature according to Butcher and Charlson (1972). The carbon quantity of different reservoirs is expressed in multiples of the atmospheric burden. Triangles in the figure represent various exchange processes the reliable modeling of which is not always an easy task since they depend upon many variables. One can see from this figure that the pathways of carbon in nature are complex. A perturbation of a given part of the cycle may directly or indirectly produce changes in any other part of the system. It can also be seen that the atmosphere is particularly sensitive to variations in other reservoirs, since only a small quantity of natural carbon is found in the atmosphere. (4) an increase in the anthropogenic combustion of reduced carbon. Many authors state that the increase of the C02 level of the atmosphere is solely due to factor 4. Thus, even at the turn of the century Arrhenius pointed out (see Bolin, 1977b) that the rise of the combustion of coal and oil might cause an increase in the concentration of carbon dioxide in the atmosphere. In the thirties, Callender (1938) formulated the same hypothesis in a more direct way. These early ideas were confirmed by the finding that the 12C02/14C02 ratio in the atmosphere was increasing (Revelle and Suess, 1957). This also strongly suggests that anthropogenic combustion plays an important role, since fossil fuels do not contain 14C. However, more recently Bolin (1977a) has drawn attention to the possibility that man's reduction of forests and cultivation of fields for agricultural purposes also may be an important factor. Stuiver (1978) speculates from measurements of the 13C content of tree rings that between 1850 and 1950 two-thirds of the C02 added to the atmosphere was due to biospheric sources caused by deforestation and only one-third was emitted by fossil fuel combustion. He also argues that at present this latter factor is the dominant one, since net biological fluxes have become negligible. There is no intent here to discuss this problem in further details. We conclude that although the past C02 increase in the atmosphere may be due to several activities of mankind, the C02 rise in the future will be determined by fossil fuel combustion. The effects of the increase of the atmospheric C02 level on climate can be estimated by appropriate model calculations. Such a calculation was made by Manabe and Wetherald (1967) who assumed that the increase of C02 level does not change the albedo of the Earth-atmosphere system. 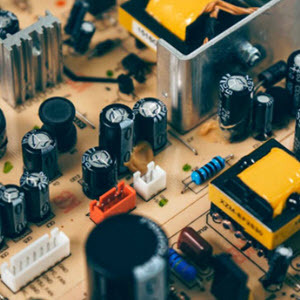 They also supposed that the temperature of the atmosphere will increase to reach a new equilibrium value because of the increase of the absorption of infrared radiation by carbon dioxide molecules. During this time the average temperature gradient and the relative humidity at different altitude remain unchanged. By using this "convective-radiation" model these authors calculated that an increase of 20-25 % in C02 level corresponds to a global-average temperature increase of 0.5 °C. 5 This stratospheric temperature decrease can modify, among other things, the ozone cycle. It is very difficult to propose a means of avoiding this inadvertent and possibly major climatic disturbance since human need for energy production is continually increasing. However, Bolin (1977b) states that "The long-term environmental effects, particularly the possibility of a change of the global climate, should determine the degree to which fossil fuels may be used as an energy source, not the magnitude of available resources of oil and coal. "6 This statement indicates a necessity to look for other energy sources that can be used without polluting our environment. Our discussion about the relationship between anthropogenic global air pollution and climatic variations can be summarized as follows. It is improbable that the variations observed from the end of the last century to date have been caused by human activity. It cannot be entirely excluded, however, that air pollution has produced marginal effects. 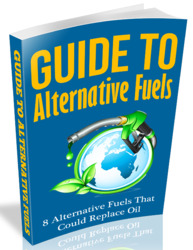 However, in the future, with the augmentation of the use of fossil fuels, more significant influences are foreseen. It follows from the foregoing discussion that the problem of climatic variations is very complex and not well understood. For this reason we must beware of hasty opinions concerning the relationship between air pollution and climate. However, on the basis of the material discussed, we may risk the following prediction. Owing to the heating effect of carbon dioxide the temperature in the lower atmosphere will rise. Anthropogenic aerosol particles at lower latitudes will cool, and at higher latitudes will heat, the surface air. If these effects are not compensated by natural factors a small, but steady, heating may be predicted. In addition, the resulting decrease in temperature difference between the poles and the equator may lead to a loss in the driving force for the atmospheric "heat engine". Such changes can lead through various feedback mechanisms (e.g. variations in atmospheric circulation, decrease in the extent of polar ice) to major irreversible consequences. We may thus conclude that it is necessary to protect the atmosphere from pollution as far as possible since the very existence of mankind is dependent on the present atmospheric composition and climate. Beyond this, a deeper understanding of the interrelation between human activity and our atmospheric environment is a challenge for all responsible scientists. 6 ll is estimated that, if all the economically recoverable fossil fuel were burned, the C02 burden of the atmosphere would rise to five to eight times its value in the last century (Kellogg, 1977).